What is the Fastest Web Browser in 2018? Even though interoperability has been conquered, browsers still want to compete on performance, so picking the fastest one is a reasonable question. But what does browser performance mean in a world in which many people now have 1 Gb/s network connections in their home, and a 4G LTE phone connection can go up to 173Mb/s? Web Performance has discontinued direct support for Selenium/WebDriver in Load Tester. One of the limitations of load testing with Selenium/Web Driver is that it takes lots and lots of cloud machines to generate load. Virtual users, on the other hand, are very efficient, cheaply simulating up to millions of users. This blog post shows one possible option, playing back your selenium scripts directly into the Load Tester recorder where they can be edited and played back with lots of virtual users. 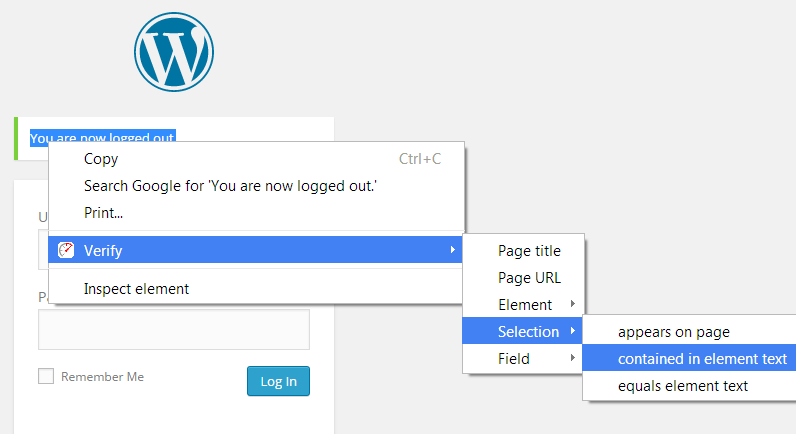 The first release of Web Performance Tester (WPT) with real browser support allow users to select items from a drop-down list (an HTML Select element) based on the text visible to a human user – just like a real user would do. There are times, however, when choosing based on the position in the list (index) or the hidden value of the selection makes a testcase more robust. This is especially true when the text descriptions of the choices may change due to variations in language, software changes, etc. Occasionally, a testcase requires a bit of information from one page in the testcase to be used on another page, later in the testcase. In some cases, this is exactly what a real user would do (e.g. click on a link chosen based on text that appeared earlier). 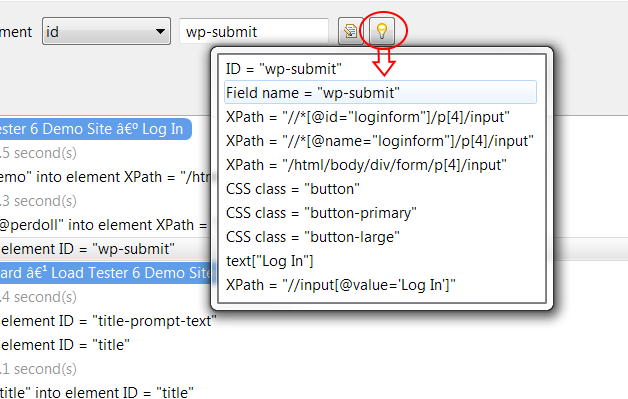 Other times, it is a hidden identifier that is used to choose the right element from a list later. Either way, an Extract a value step can be used to get data from the browser. With Web Performance Tester 6.5 (WPT), you can easily organize the steps in your testcases into groups to make them easier to read and maintain. You can create groups within groups with no limit on the depth. 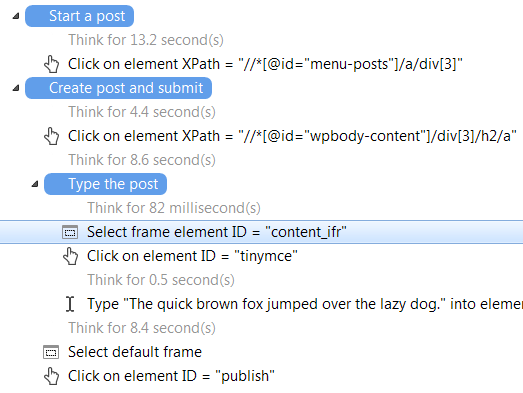 This example shows three groups – the 3rd (Type the post) is contained in the 2nd (Create post and submit). The fourth group, not shown here, includes all the steps in the testcase (i.e. the entire testcase is a group). Dealing with file downloads is considered by many to be problematic when developing testcases with Selenium/WebDriver. Web Performance Tester (WPT) makes this task relatively effortless when working with Chrome – when the virtual user will initiates a download (by clicking something), the file will be downloaded into a directory that exists only for the duration of that testcase. This solves one problem – running out of disk space due to files downloaded during test iterations – because when the testcase ends, the temporary folder is removed along with the downloaded files. Real-browser testing can increase your productivity over other testing methods. The features added in the 6.4 release will help you work even more efficiently! One of the more challenging aspects of working with real-browser testcases is locating the element that you need to interact with. Starting in 6.4, a suggestion button next to every locator field will provide a variety of different locators that you can try if the default locator does not work. These suggestions also help you learn how to create locators – as you will see a wide variety of locator suggestions provided. Real browsers vs virtual browsers: which to choose for your testing? Since version 6, Web Performance Tester has supported two different ways to simulate user behavior on a website for testing: real browsers and virtual browsers. These two methods take very different approaches to the problem and each has different advantages and disadvantages. Those are not always obvious at first glance, so I’d like to run through the key difference to help you decide.